And If You Will Come to Me reflects the next phase in a personal journey that began nearly three years ago when he put his 14-piece supergroup The Idan Raichel Project on hiatus and began performing more intimate solo and small ensemble concerts. Idan Raichel has been enjoying one of the most successful years of his career, after releasing a string of hit singles and performing dozens of sold out shows. Idan’s latest creation, the song “At Lo Nish'eret Levad (You Are Not Left On Your Own),” will surely continue his winning streak. Idan wrote the song, and filmed the accompanying music video, during travels to Italy, Angola, Germany, Colombia, Austria, Argentina and Ethiopia. The song and the other singles Idan has released this year, will be included on his upcoming full-length album, which is set for release on February 1st, 2019. Order the new song at store.cumbancha.com. The new single “And If You Will Come to Me” brings together the soaring compositional artistry of Idan Raichel - one of the biggest stars in the history of Israeli popular music and a major figure on the world stage - with the free flowing, improvisational guitar stylings of Billboard chart- topping American world fusion guitarist and composer Lawson Rollins. The song is presented in two forms in this single release: a thrillingly fast-paced version that takes its influence from modern electronic music, and a traditional acoustic ensemble arrangement featuring Lawson on Spanish guitar accompanied by Grammy-winning violinist Mads Tolling, bassist Dan Feiszli (Julio Iglesias) and percussionist Davo Bryant (Ottmar Liebert, Baba Olatunji). Idan Raichel is a global music superstar who has collaborated with with American pop stars India.Arie, Dave Matthews and Alicia Keys, not to mention a wide range of artists who are household names in their native countries. Berry Sakharof is known as “The Prince of Israeli Rock” and has been one of his country’s biggest stars for over 40 years. Together, these two musical titans have created a solid blend of pop and world music that will surely become a major international hit. In response to popular demand from his fans, Idan Raichel has recorded an acoustic solo piano version of his hit song "And If You Will Come to Me." Since the original version was released in February, Idan has been contacted many times by couple asking permission to use the song in their wedding ceremonies. In honor of these requests, Idan decided to record this new, intimate version. Idan Raichel brings us Beresheet - a new song which he wrote during his travels, inspired by several unexpected encounters with people from Africa and India. The song is accompanied by a beautiful video created by the sand artist Ilana Yahav, who brings her visual interpretation of the song in a sensitive and heartwarming way. Order the new song at store.cumbancha.com and click here to watch the "Beresheet" music video. 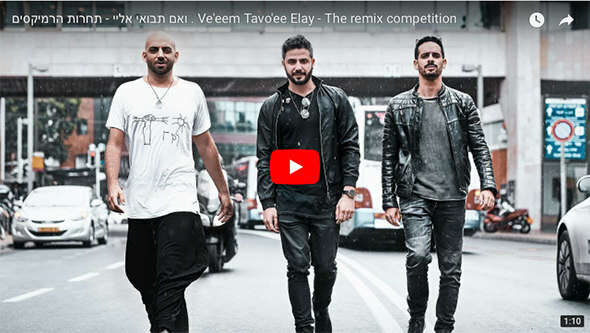 Idan Raichel and TripL invite you to enter the "Ve'eem Tavo'ee Elay" Remix contest. Click this link and check out the video below for more details. Idan Raichel has teamed up with Israeli DJ/Producers TripL on a new version of Idan’s latest single "Ve'eem Tavo'ee Elay (And If You Will Come to Me)”. Formed by Lior Brosh and Omri Cohen, TripL is one of Israeli dance music’s hottest acts. They have performed at the world’s biggest EDM festivals alongside Avicii, Tiesto, Hardwell, Steve Aoki and many others. After looking for new producers to collaborate with, Idan teamed up with TripL to create a special EDM version of his recent hit song. Currently on a major North American tour, Idan Raichel presents a new single: "Ve'eem Tavo'ee Elay (And If You Will Come to Me)." Idan wrote the song during a nine-month break from the road, when he was able to spend much-needed quality time with his family. Idan arranged and produced the recording in collaboration with producer Noam Akrabi. After a couple of years focusing on his solo piano project, Idan plans to return to the stage with The Idan Raichel Project this summer, with a series of four concerts in front of daily audiences of 40,000 people at Amphi Live Park in Rishon LeZion, Israel.